This is a review for LORD & BERRY Mascare High Definition and Treatment - Black 1350. Other names: Lord & Berry Mascare eyelash code 1350, Lord & Berry treatment mascara, Lord & Berry Wardrobe Mascara. The 1350 variation is available only in India. 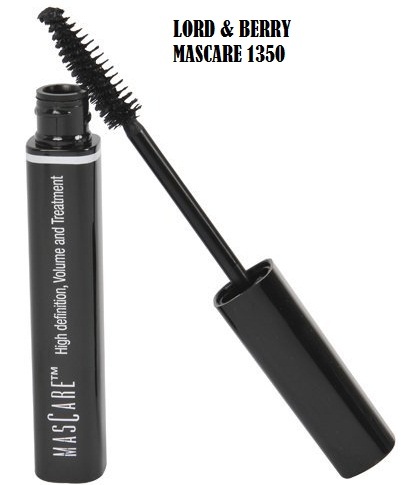 Internationally, 1351 is available as the wardrobe mascara. I am not sure of the difference. 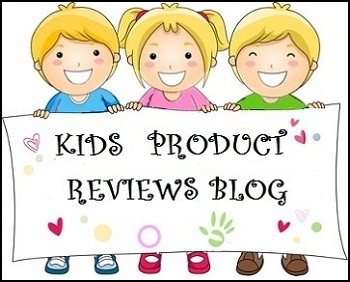 I wanted to do this review for a long time, but had mixed feelings for this product. I didn’t find ANY reviews for it, when I bought it. But I have now used it extensively. So this review is as honest as can be. INR 890 (Not mentioned on the package). Available for Rs 699 at urbantouch.com. Not mentioned on the pack. To be used within 6 months of opening. LORD & BERRY treatment mascara enriched with LXB Complex. Opthalmologically tested, for sensitive eyes. MASCARE: High definition, Volume and Treatment. Lord & Berry Mascare Black 1350 is supremely soft and creamy texture. Never gets smudgy or blurry. Magically seals in 30 seconds. Long-lasting and water-resistant. Opthalmologically tested and safe for sensitive eyes. Lord & Berry is an Italian brand in business since 1992 and is presently selling in 25 countries. I first saw this brand on goodlife.com, when searching for a black waterproof mascara. I actually wanted to buy their Raincoat Waterproof mascara, but that went out of stock on goodlife.com. I needed one for an upcoming party, so bought this water-resistant alternative from urbantouch.com. MASCARE is a holistic approach to mascara that strengthens and treats lashes, as well as enhances their volume, definition and length. It is infused with Silk Proteins, Panthenol and Vitamin E to keep lashes fit. Black metallic pigments give colour, both light reflecting and defining. Mascare is an ‘Eyelash Spa’: healing and beautifying lashes simultaneously. High Definition: Somewhat, makes lashes look black and long. Treatment: Not sure. But it does not make lashes hard like other mascaras. Opthalmologically tested and for sensitive eyes: Though the formula itself doesn’t sting, it withers off in very small black particles (highlighted in the pic below in pink stars) which at times get into the eyes and cause irritation. It takes a while to master applying this mascara as the tip of the wand is unusually long, and needs a lot of precision to handle. 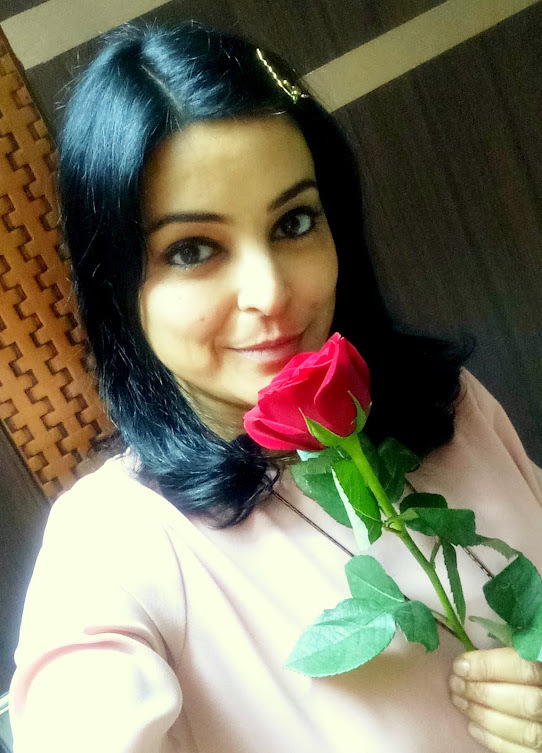 I have usually seen women craning their neck forward near the mirror and opening their eyes WIDE open to apply mascara. But if you do that with this mascara, you will only end up with a lot of black mess around your eyes. This mascara has a very particular way of applying it, especially if you have long lashes. Have you ever watched eye makeup being applied to models on TV? Well, that’s how this and any other mascara should be applied to get well defined highlighted lashes, without straining your eyes, neck and hand. For the upper eyelashes: tilt the head back and look down. Apply starting from the roots and sweeping towards the tips. For the lower eyelashes: tilt the head forward and look up. Lord & Berry Mascara 1350 with black withering particles highlighted in stars. Smell: Very light soothing sweet natural scent. No perfume. Very pigmented. Gives a RICH black color to lashes. Comes off simply with a splash of water into my eyes, without even a hint of burning. But you do need to clean the blackness from your face in that case. No volume, some definition to the lashes and yet a very big price tag. It is sold as water resistant and still costlier than the leading waterproof mascaras in the Indian market. 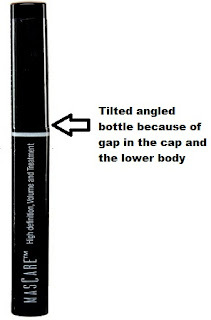 The packaging is full of flaws: The tube is not straight. 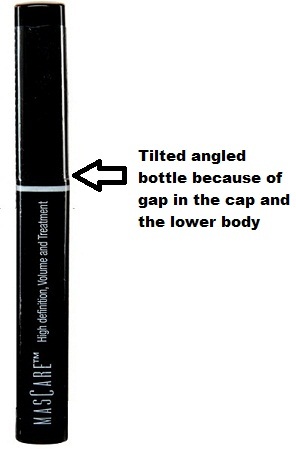 There is a gap in the tube and the brush part (See pic below), which lets dust and air to enter. The bottle doesn’t stand and keeps falling. No expiry/mfg date or MRP mentioned. Forget Eye Spa, I find broken lashes on my cheeks after removing, almost every time. The black metallic particles in the formula keep withering off and settle on under eye and cheeks. Need to be brushed off every couple of hours. They also get into eyes at times and irritate them. Not water resistant. Comes off easily in a splash of water and leaves panda eyes. 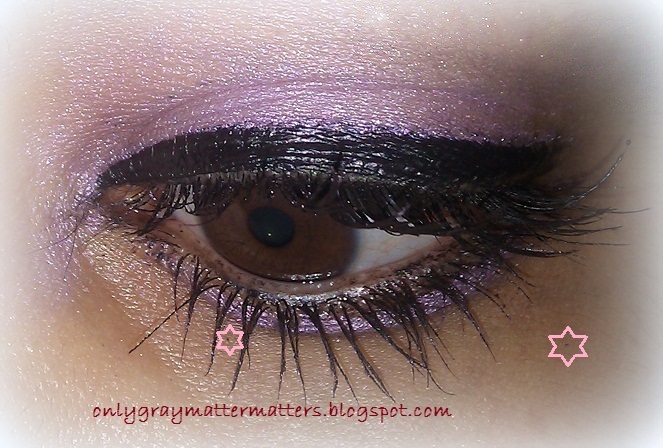 The tip of the wand being extra long, dirties the upper eyelids. So if you are using this along with eye shadow and other makeup, you need to redo the eyeshadow and eyeliner after the mascara. Too much effort. Most cosmetics have to be used within 12 months from opening and this one has to be used just within 6 months. This mascara is nothing but plain black ink for your lashes with a very high price tag. If you just some rub petroleum jelly into your lashes, they will look equally black and shiny. It is a complete waste of money. When I look into the mirror, the lashes look highlighted. But caught on the camera, it is like you are not wearing mascara at all. As you can see in the ‘Before and After’ pic below, the lashes look the same in the two except for a little blacker in the pic with the mascara. Will I buy again? Never. It was a mistake to buy this. Can anyone recommend a good black waterproof volumising mascara?